As the semester winds down, the intensity always ramps up. Don’t worry, the UGL has you covered. 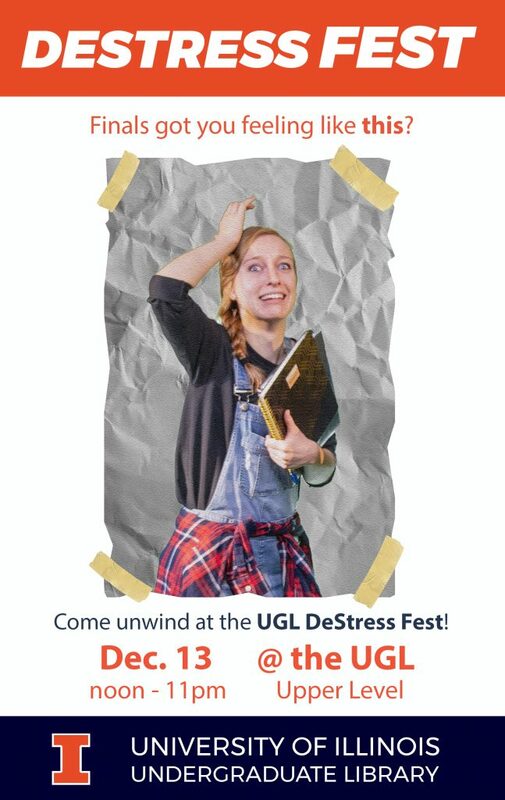 On Reading Day, Thursday December 13th, we have programming to help curb your stress with our semesterly De-Stress Fest! Choose your own adventure by looking at the categories of programming we have below. For a concise hourly schedule, see the image at the bottom, but be sure you stick around for 8:00p.m.…because you never know what Uggles has up her sleeves—er, paws. Tackling that Final Research Paper or Project? Starting at 12:00p.m. you can join the Writers Workshop in their “Long Night Against Procrastination” to fight the monsters that are your final writing projects. Research consultations will also have extended hours starting at 2:00p.m. until 10:00p.m. in the consultation corner. The Writers Workshop will close at 11:00p.m.. Need to take a break? The graduate assistants hear you and we want to get crafty! Come procraftinate with us all day long from 12:00p.m. to 4:00p.m. and 5:00p.m. to 8:00p.m. in the new books section of the UGL. We will have coloring pages, pet rock painting, and button making. If you don’t have time to craft, pick up a de-stress bag full of word puzzles and brain teasers that you can use to take a break between flash cards, math problems, or book chapters! 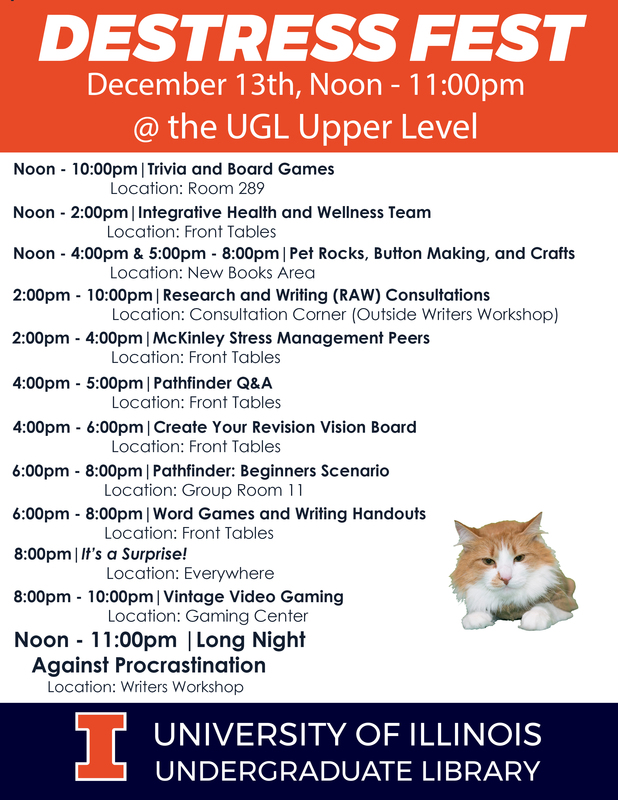 Come to room 289 to participate in a variety of board games, party games, and an Illini trivia session. If you can pin the tail on Uggles or beat a team of friends/strangers at trivia, you can win a small piece of sugary motivation. (Candy, the motivation is candy.) You can also play one of the board games out of the UGL board game collection! If you’re into video games, we have that too. From 8:00p.m. to 10:00p.m. in the gaming center, come test your gamer skills on vintage games with classics like Mario Kart, Dr. Mario-Tetris, Street Fighter, and more! Need to vent or manage your stress? The Integrative Health and Wellness Team will be in the UGL front lobby from 12:00p.m. to 2:00p.m. and the McKinley Stress Management Peers will have stress balls available for free from 2:00p.m. to 4:00p.m. Want to escape the real world for a while? We hear you, and we have just the people to help! Several members of the Pathfinder Society who know how to play the popular Dungeons & Dragons Pathfinder game will be around to answer your Pathfinder related questions from 4:00p.m. to 5:00p.m. in the UGL front lobby. Then you have a chance to use your new knowledge to play a beginners scenario in UGL Group Room 11 from 6:00p.m. to 8:00p.m. See our full schedule below! 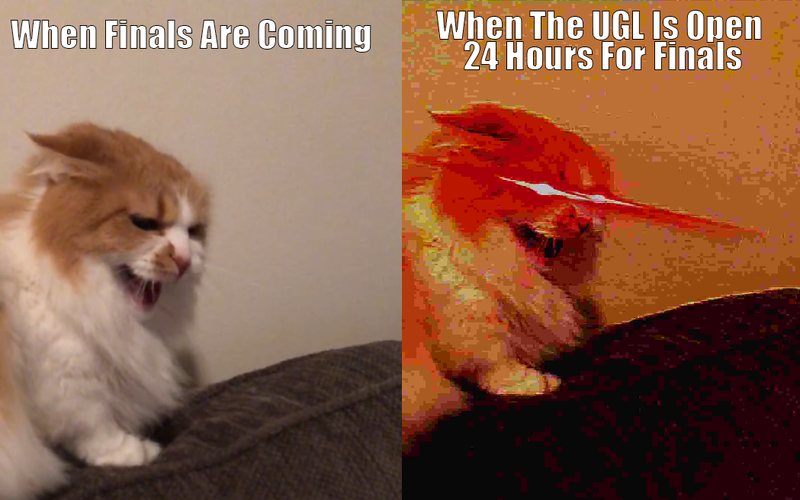 Finals are upon us but the UGL has got you covered. We are extending our hours! Starting December 9th, the Undergraduate Library will be open 24/7 until December 20th at 7pm. Leave your snoring roommate behind and take advantage of the extra time to get ready for Finals. While the library spaces and printers will be open, not all services will be offered during our extended hours. Below is a list of our service hours. Sunday, December 9th: 11:00a.m. – 12:00a.m. Thursday, December 13th: 7:00a.m. – 12:00a.m. Saturday, December 15th: 8:00a.m. – 12:00a.m. Sunday December 16th: 8a.m. – 12:00a.m. Thursday, December 20th: 8a.m. – 6:00p.m. Friday, December 21st: 8a.m. – 1:00p.m. Remember, after 10:00p.m., you will need your i-card to access the building. If you would like more information on our available services during these hours, please see our Service Hours. Pick one of these movies, and we’ll tell you where to study! What can we say? This time of year, we’re dead inside, but we’re still fun. You can come to the UGL on Reading Day for fun crafts and games, but also see the zombie-like shells of your fellow students studying for finals. We are here to help you feel as alive as possible when finals have you feeling less than human. 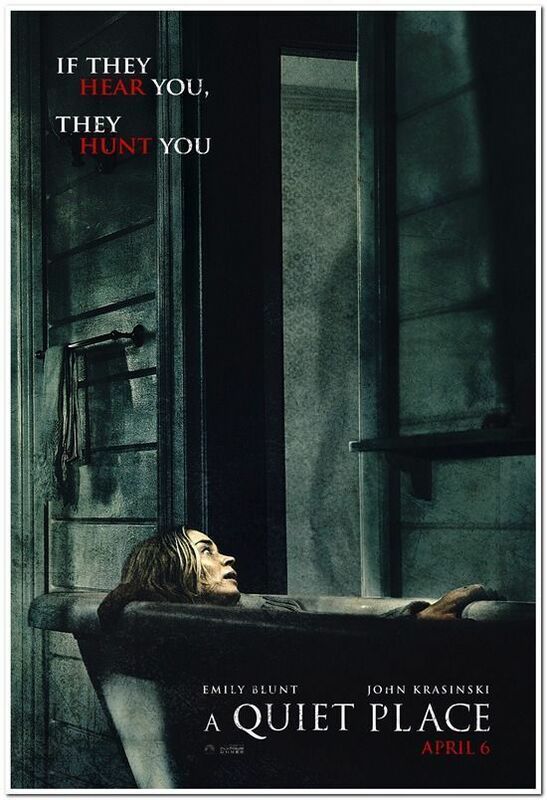 If you like this movie, you’ll love the Grainger aesthetic. As the Engineering library on campus, it has plenty of computers and study spaces for you to do some serious studying. There is also a virtual reality lounge and a 3D printer if you stop by the IDEA lab! 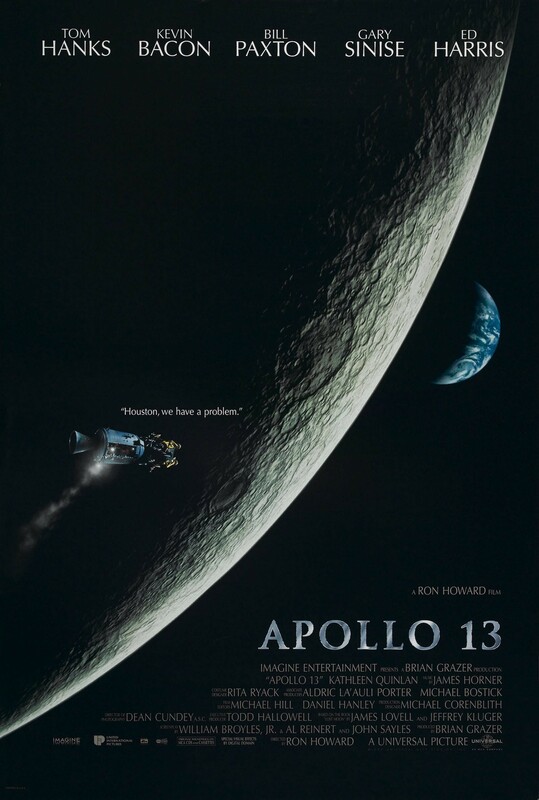 Lovers of Apollo 13 will feel inspired to overcome their study woes. If Tom Hanks can get back to earth, you can conquer this final. If you like this movie, you like the comfort of your own home—away from any intense noises that could get you eaten by an alien. Want to know how to guarantee a quite study space? Stay within the comfort of your own room. Sometimes finals are meant to be defeated in silence. 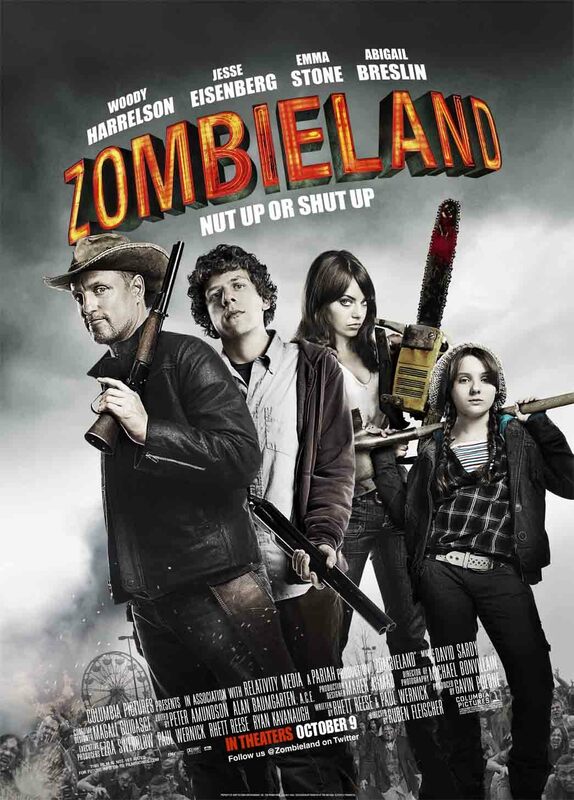 Did you know you can get all of these movies at the UGL? Stop by and grab them, or another one from our collection, to get a break from the study marathon.